Michael Franti is a man who wears many different hats: father, poet, musician, writer, filmmaker, and crusader for human rights, truth, honesty and fair play. Politician, however, is not likely to be a part of that list anytime soon. "They'd have to create a new position for me: court jester," chuckles Franti over the phone from his studio called The Sugar Shack in San Francisco, where he's busy writing songs for a release next spring. "I would love to be in the cabinet; I'd love to just sit in the Oval Office, strum my guitar, wear a silly hat, and make fun of the president all day long." Everyone wants a piece of Franti these days, for different reasons. There are those anxious to praise his personal mettle and longstanding commitment to peace and social justice, others eager to challenge his methods and motives, and plenty more burning to question his patriotism because of his stance against the U.S. government and its war in Iraq. (And, yes, some folks even track him down to talk about his recording career, time permitting). Franti is willing (nay forced) to defend his world view, keen to engage any and all comers, friend or foe, from the right or left. Such is the life of a musician (or anyone who speaks out) in the divided America of the 21st century. It can be tricky. Candidates for the U.S. Senate want to "boycott the boss," (Springsteen that is) for mixing anti-Bush politics with rock 'n' roll; and Linda Ronstadt finds herself shouted down with "baby, you're no good," and stripped of a room key in Vegas. It's a brave new world, and Franti and his group Spearhead have seen it first-hand, including a visit from the military. "One of my band members has a sister in the army, stationed in Iraq," explains Franti, the episode still very fresh in his mind. "On March 16 last year, just before the war started, two officers came to his mother's house and asked some questions, specifically about having a son in a group openly opposed to the war, whose sister was in the army. And they had a pretty extensive file on us and our personal business and were looking for more information. It was pretty surprising." In spite of the hostile climate, and in many ways because of it, Franti is more determined than ever to speak his mind. "Today, I feel more inspired, more alive, and more invigorated by my creativity than I ever have before," he says, his voice charged with enthusiasm. "More than ever, I just feel compelled to write about and express the things that are going on in my heart." After 18 years, and eight records (the latest being 2003's Everyone Deserves Music), the 36-year-old songwriter, once a petulant firebrand, has grown to become a steady voice for positive change in a wilderness of public paranoia, chronic cynicism, closed minds, and cold hearts. Does he ever get overwhelmed by the state of the world? "Oh yes, almost every day," Franti says. "But that's why I go laugh with my friends, and joke around - for release. I have a kayak, so I take that out in the morning in the bay. I practice yoga, and try to remain focused that way. I've also tried surfing twice; I think I got up on my feet for about two seconds. But I'm always hopeful." Fortunately, It didn't take him long to get a strong footing in music. Back in 1986, Franti, alongside partners Rono Tse and Kevin Carnes, first made waves in San Francisco with The Beatnigs, a strident collective churning out tough rhythms, industrial-strength samples of natural city sounds, and pointed political verse. The band signed to Jello Biafra's Alternative Tentacles label, released one record, toured extensively and ran its creative course. 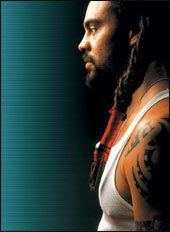 Stimulated and looking for another venture to express his ideas, Franti happened upon six-string wizard Charlie Hunter. The two clicked and, alongside old Beatnig pal Tse, formed hard beat hip-hop fusionists The Disposable Heroes of Hiphoprisy in 1991, signing to Island Records the following year. Things were looking up. Turning its focus towards such topics as the media (Television: The Drug Of The Nation), homophobia, and racism, the band's brash, politically charged record Hypocrisy Is the Greatest Luxury was turning plenty of heads, including Bono's. U2's ringleader asked them to join the bands '92 Zoo TV tour. Looking back, Franti recalls lofty goals. "I believed that music could change the world overnight," he says of the early days. "And I don't know, or have yet to see it change the world overnight. But I do know that music can help us through a difficult night. I slowly came to realize that." It was a revelation Franti was to explore. Despite the initial buzz, his tenure with The Disposable Heroes was short-lived, as was his relationship with Island. Franti, driven by his new-found desire to help people through a difficult night, formed Spearhead, signing with Capital Records in 1995. The band, a joyful mix of funk, soul, hip-hop, reggae and shades of punk, took pride in its ability to both stimulate people's minds and move their feet with monstrous grooves, a combination Franti favours to this day. "The lyrics are one thing, but the music and the way you convey it is another," he explains. "Without the music being fun, without the music being danceable, without the music having words you can sing along to, you don't get anywhere. So even if I'm saying something serious, it can still be presented in a way through song that is uplifting rather than heavy, so it can reach everyone." With the soul of Marvin Gaye, the spirit of Bob Marley, and the vision of Curtis Mayfield, the tough-talking, hard-rhyming Franti is reaching the height of his creative powers. He's stepped away from the majors, heading up his own, Boo Boo Wax record label and hopes to touch everyone that he can, living up to the words of poet Gil Scott-Heron: "If each one reach one, each one teach one." Franti recently had the chance to do just that in the Middle East. Last June 2 through the 15, he lead a delegation of activists, artists, musicians, peace workers, and filmmakers on a journey to Iraq, Palestine and Israel. "I got tired of hearing about the economic and political cost of the war without ever hearing about the human cost of the war," he says. "So when I got there, I heard all kinds of horrific stories of people who had lost their homes. I played music for kids in hospitals who had their limbs blown off, I spoke to the troops, and saw the utter devastation that is Baghdad that you'd never see on TV. It was an eye-opening, emotional experience." Franti has plenty on his plate. In between sessions for the new Spearhead record, I'm Touching Really Deep Into My Reggae Roots, and spoken-word performances, he has plans to write "a couple different books," create TV programs and piece together a documentary chronicling his trip through the Middle East, with another excursion to Africa in the works. And keep his eye on George. W. Bush. "I'm pretty energetic about everything right now," he says in the run-up to the U.S. elections. "I just want to be of service to people, and be the best communicator for social justice I can be."